God of all creation, you gave your bishop Polycarp the privilege of being counted among the saints who gave their lives in faithful witness to the Gospel. May his prayers give us the courage to share with him the cup of suffering and to rise to eternal glory. We ask this through our Lord Jesus Christ, your Son, who lives and reigns with you and the Holy Spirit, one God, for ever and ever. Amen. 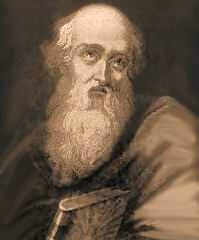 St. Polycarp of Smyrna, was converted to Christianity by St. John the Evangelist. He was a disciple of the apostles and friend of St. Ignatius of Antioch. He was ordained bishop of Smyrna (now Izmir, Turkey). He was about eighty-six when the Roman pro-consul urged him to renounce Christ and save his life. St. Polycarp said, "For eighty-six years I have served Him and he has never wronged me. How can I renounce the King who has saved me?" He suffered martyrdom in 155 by burning at the stake in the amphitheater of Smyrna. "The memory of that time when as a youth I was with Polycarp in Asia Minor is as fresh in my mind as the present. Even now I could point to the place where he sat and taught, and describe his coming and going, his every action, his outward appearance, and his manner of discourse to the people. It seems as though I still heard him tell of his association with the apostle John and with others who saw the Lord, and as though he were still relating to me their words and what he heard from them about the Lord and His miracles. . . ."
"At Smyrna, the death of St. Polycarp. He was a disciple of the holy apostle John, who consecrated him bishop of that city; and there he acted as the primate of all Asia Minor. Later, under Marcus Antoninus and Lucius Aurelius Commodus, he was brought before the tribunal of the proconsul; and when all the people in the amphitheater cried out against him, he was handed over to be burned to death. But since the fire caused him no harm, he was put to death by the sword. Thus he gained the crown of martyrdom. With him, twelve other Christians, who came from Philadelphia, met death by martyrdom in the same city." Read St. Polycarp's Epistle to the Philippians.